The gloriously voluptuous Roadmaster was a serious set of wheels and to own one meant you really arrived. Not ready to join the era of large rear fins, the 1957 BuickRoadmaster proudly hailed its lower and leaner look. With a ground clearance of only 5″ and a dramatic sweepspear that kicked up over the rear wheel arch, the ’57 Roadmaster gave a beautiful profile zipping around Americas highways. Buick referred to the new design as a “low sweep silhouette” – a shape that better harmonized with the stylish wraparound windsheilds and backlights introduced by General Motors in 1954. 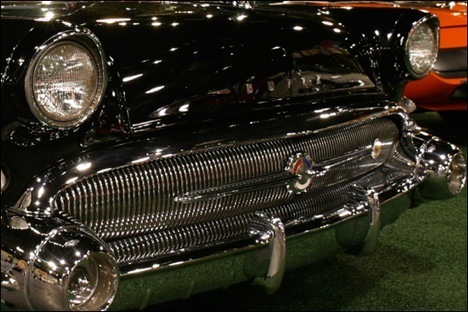 On average, the 1957 Buicks measured 3″ lower at the roofline and were over 3″ longer than in 1956. To go along with this low and lean profile, the Roadmaster featured a new “Electric Shaver” grille with large bumper bolsters, wrap around windshields and a 364 cubic inch 300 horsepower V-8 engine. This engine was equipped with a four barrel carburator and handily able to launch a four door Roadmaster from a stand to 60mph in 10.6 seconds with a top speed of around 120mph. With a 10:1 compression ratio, 364-cubic inch engine developed a hefty 400 foot pounds of torque at 3,200 rpm. Compared with the previous years models, the 1957 Roadmaster had 17% more horsepower. 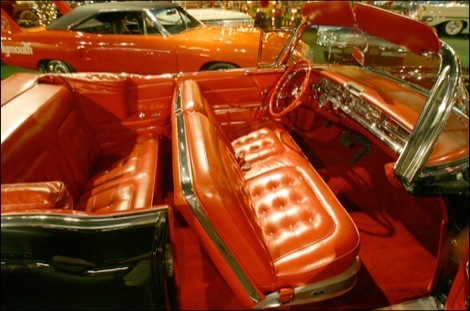 Priced at $4066, 4364 of these gorgeous convertibles were produced. The Roadmaster was an automobile built by the Buick division of General Motors. The origins of the Roadmaster name date to 1936 when Buick renamed its entire model lineup to celebrate the engineering improvements and design advancements over their 1935 models. Buick’s Series 40 model range became the Special, the Buick Century took the place of the Series 60 and the Series 90 became the Limited. Buick’s Series 80 became the Roadmaster. Roadmasters produced between 1936 and 1958 were built on Buick’s longest wheelbase and shared its basic structure with senior Oldsmobiles. Between 1946 and 1957, the Roadmaster was Buick’s premium and best appointed model, and was offered in sedan, coupe, convertible and station wagon body styles between 1936 and 1948. In 1949 a hardtop coupe, designated “Riviera” joined the model line up; a four-door hardtop joined the model range in 1955. 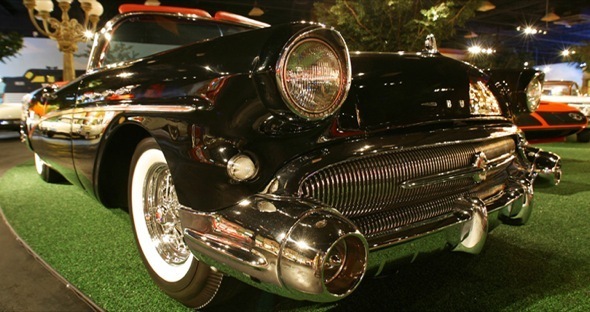 From 1946 through 1958 they were the most elegant and prestigious automobiles that Buick sold. In 1959 Buick again introduced a model range that represented a significant shift in its body design, and the Roadmaster name was replaced by the Electra name.